Cal here and it is time for Tuesday Stretch. With the recent discussion about how difficult it is to find Orange Peel punch cups versus custard cups, I thought I would comment on punch sets tonight (I’ll finish my previous topic another time, really I will!) In StretchGlassLand we have a similar challenge finding punch cups. 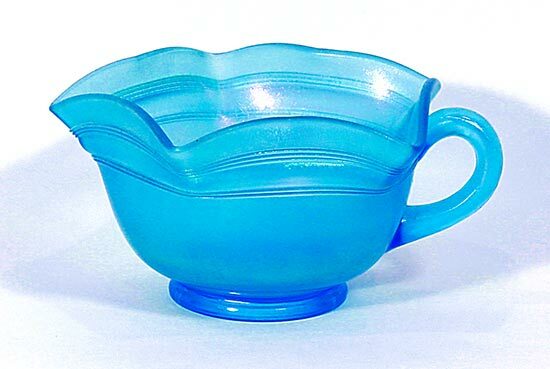 To the best of my knowledge, there are no custard cups for us to find as substitutes as I don’t recall a single company which made custard cups in stretch glass. 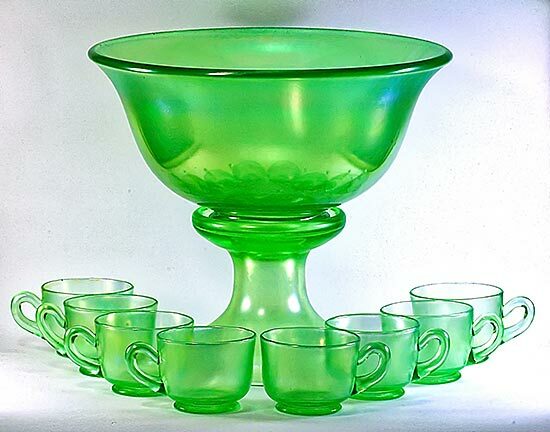 By the time stretch glass appeared in the market, it seems the favored dessert was sherbet, so we have an abundance of sherbets in stretch glass, but they are nothing like punch cups and there is no danger of confusing them. Punch cups in stretch glass are tough to find. 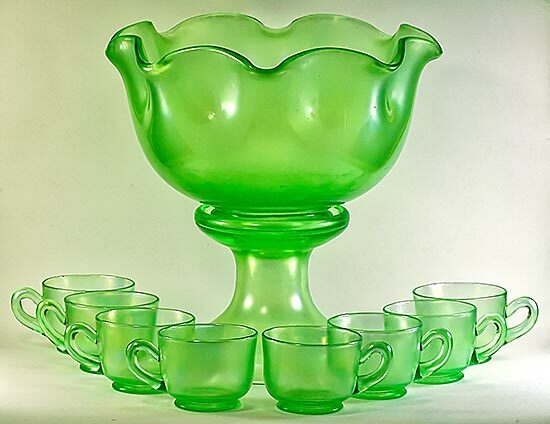 There are several sets in various collections but some collectors don’t even have a single punch cup to go with their punch bowl(s). The punch bowls, for the most part, are more available than the cups or the iridized bases. 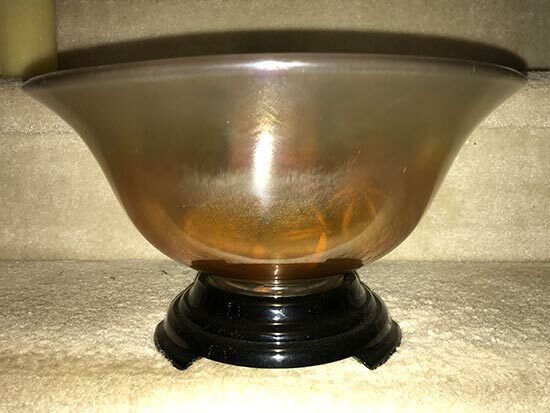 There are black, as well as iridized bases for the punch bowls and apparently more folks opted for the black bases than the iridized ones, because there are plenty of black bases and only a few of the iridized ones. We have discussed punch cups before here and so we are aware of at least one punch cup in Grecian Gold and Ruby in addition to the Celeste Blue, Florentine Green and Persian Pearl ones. 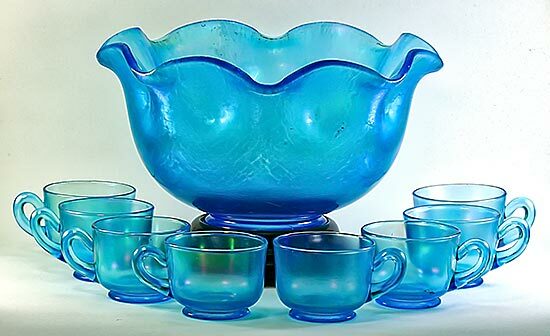 I am fortunate to have 8 Celeste Blue and 8 Florentine Green punch cups and the punch bowls to go with them. I also have a Florentine Green iridized punch bowl base. Several companies made punch bowls but only Fenton and Diamond made punch cups. Apparently there was either not much demand for them or a lot of them were broken or discarded in the intervening years since they were made. 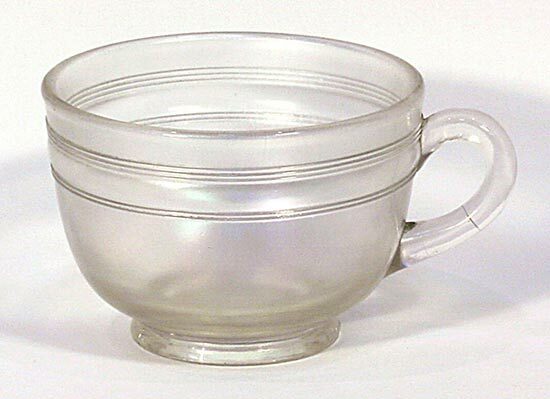 The Fenton punch cup is a “typical” punch cup. Here is the original punch cup from the 1920s-30s. 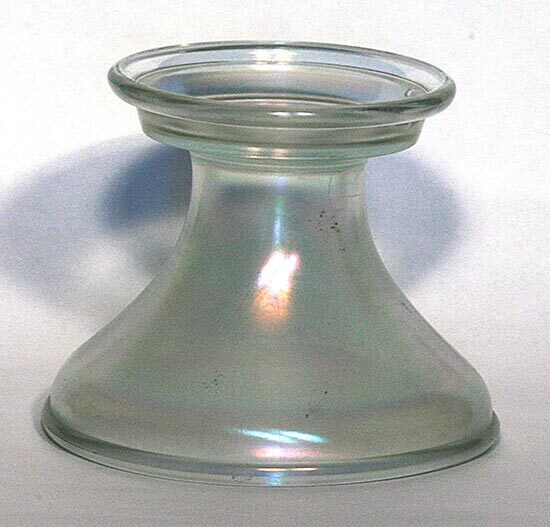 Just a couple years ago a punch cup was made in a Fenton mould by Ann Fenton,. These were made at the request of the Stretch Glass Society, were only made in Ruby (red) and in very limited quantities as, once again, there was minimal demand for them from collectors. 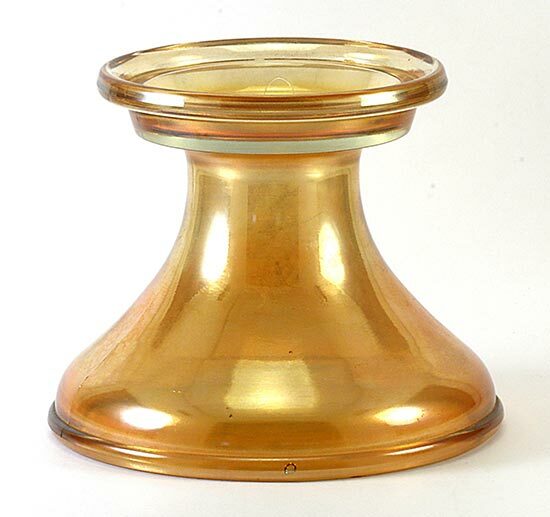 These can be found in at least 3 varieties – straight sided with a mould seam visible on the top rim of the cup, straight sided with a ground top and slightly flared with a ground top. The colors and iridescence varies significantly from Amberina to a dark Ruby. Ann and her team also made several whimsies when they were making the cups. 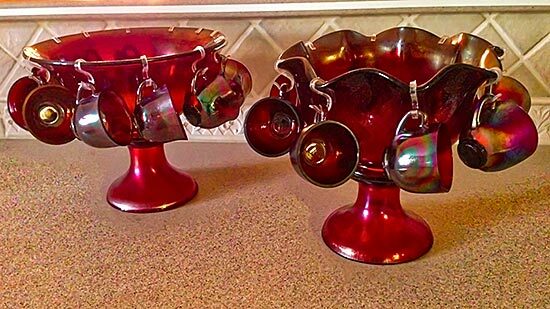 Here is a set of the dark ruby straight sided and a set of the dark ruby flared cups on red punch bowls with iridized bases. Diamond also made punch cups. 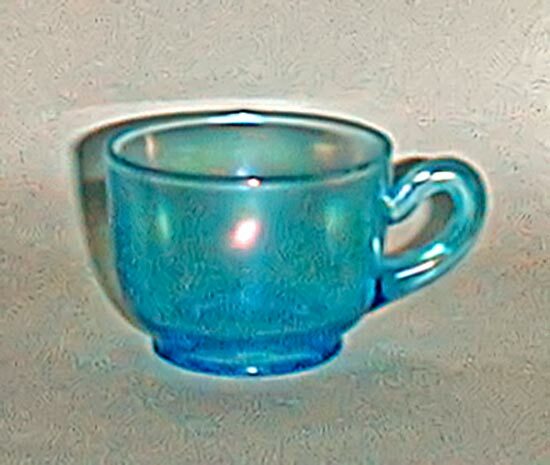 Take a look at this blue “punch cup” and tell me how you are going to drink punch out of it! A few of these are known, again, a really tough item to find. Here is the “normal” punch cup in Crystal. If you have one, or another Diamond punch cup, please share a picture. We would love to see what you have. Northwood and Imperial made large bowls which are referred to as punch bowls, but there are no punch cups to go with them. I’ll close by commenting on punch bowl bases. 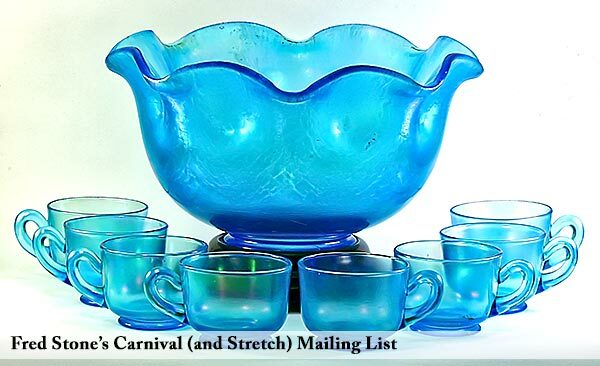 Fenton and Diamond made iridized punch bowl pedestal bases very similar in shape to the ones made for carnival glass punchbowls. 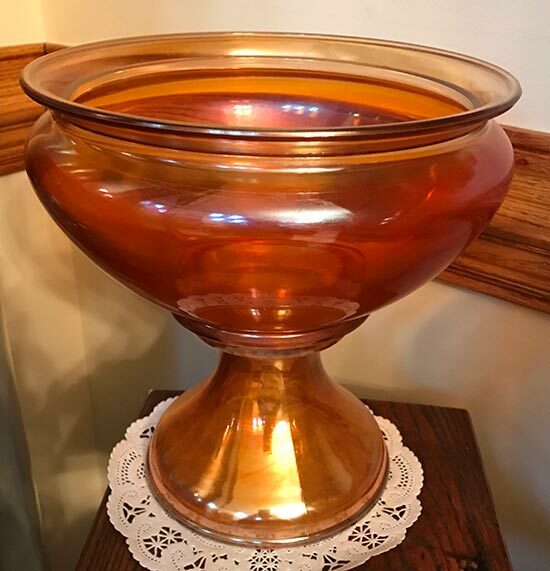 The Fenton and Diamond bases are slightly different from each other, as are their punch bowls, and as you might imagine, the “other” punch bowl doesn’t fit particularly well in the “other” base. We know of only a few of these bases in colors other than Ruby. The Ruby ones were scarce for many years, but within the last 10 years more of them have appeared on the market so I will put them in the “hard to find, but available” category today. They are still in demand and will typically sell in the $700-$1000 range, often with the punch bowl included. As I mentioned earlier, there are Fenton Florentine Green bases. My other two stretch glass contributors and the rest of you will have to jump in and confirm the existence of other colors, if you have or know of them. From Diamond we know of a Crystal and a Marigold base; maybe there are others. Here is a Marigold bowl and base. This was sold as a fish bowl and it may well be that or it may have been intended to be a punch bowl – it came with the base, so we are pretty sure they go together but I am not aware of any cups to go with it. BTW, Fenton also made a punch bowl in Grecian Gold; it is the usual flared shape. I hope you will be getting out your punch sets and using them as you celebrate the holidays.